"Kick Start Your Fitness Program." As I prepare my comments, I would appreciate any questions/ideas/facts/suggestions from the "blogging community." If you'd like me to cover something specific, just leave a comment below, or e-mail me directly. Oh, by the way, I'll plan to make the recording available as an MP3...just let me know if you'd like me to send you a link. 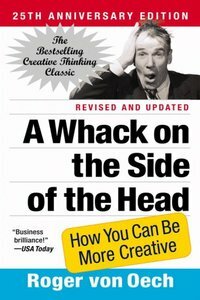 How "CAN" you be more creative? Ok, now wait a minute...if you found yourself reading the title of this post [How "CAN" you be more creative? ], and thought anything like the following, you are ALREADY creative! "Yeah, how CAN I be more creative?" "Oh, I can't do that, I'm not really a creative person." "Wow, how did Jason know exactly what I was thinking about today?" "He has no idea who I am, I am ALREADY as creative as I want to/need to be." A coach for students...off the field? I took this picture while walking through town this morning... The Tennis Tournament is on this weekend! The Quarterly: Do angry people—malcontents, in your words—make for better innovation? Can you be innovative and also happy? Brad Bird: I would say that involved people make for better innovation. Passionate involvement can make you happy, sometimes, and miserable other times. You want people to be involved and engaged. Involved people can be quiet, loud, or anything in-between—what they have in common is a restless, probing nature: “I want to get to the problem. There’s something I want to do.” If you had thermal glasses, you could see heat coming off them. How do you find the involved creative types? How do keep them on your team? What advice would you have for someone who is "semi" engaged with their work? What is a "job-skill" we're not teaching in high school that kids could really use in the next 10 years? How important is "design" to you? I finally got it this week. I just finished reading Made to Stick. I finally realize that it is not all the books with their statistics and theories about design and usability that stuck. It is the personal experience that I had years ago (with a previous employer) when I participated in a usability study of the software that my team was writing. Are you engaged with and by your interests? 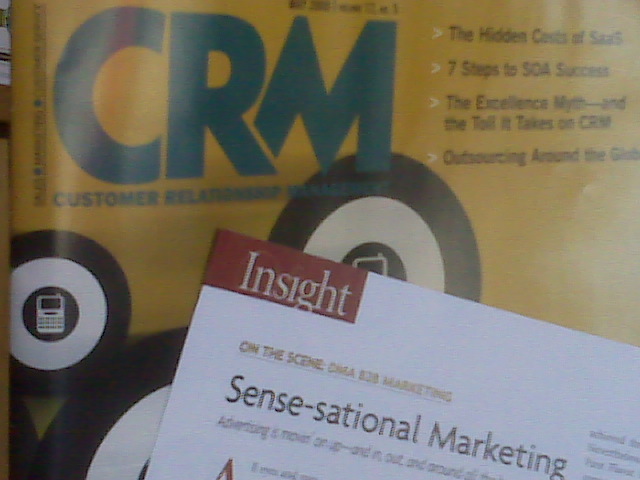 I continue to learn a thing or two about my own professional development from customer relations theory and practice. Here's one I picked up today: If there is some behavior I'm looking to change, I have to "sense-sationalize" it. "The average consumer is hit with 1,600 commercial impressions a day..."
You're noticing more than you notice every day. So, plan to make what you DO notice more of what you WANT to notice. Make sense? Are you winning-winning? Or, is there still room for improvement? Every morning I can (is easy to do whether I'm home or a hotel), I sit down to read through what is quickly becoming my favorite newspaper: the FT - Financial Times. 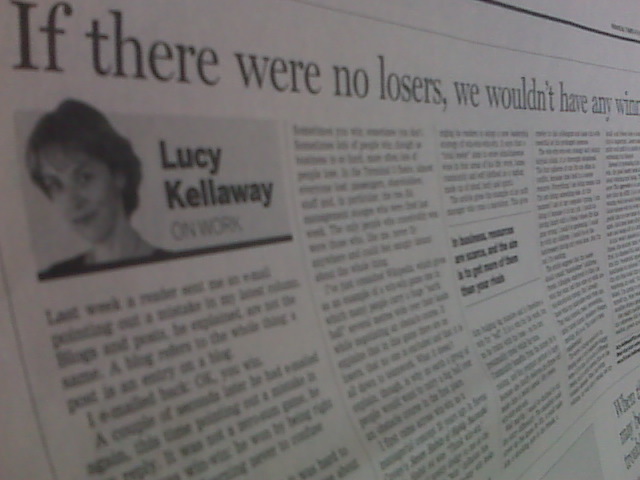 On 21 April 2008, Ms Kellaway penned an incredibly thought-provoking article on "winning and losing." From my perspective, the take-away is: Sit down to reconsider what "win-win" means to you. Something I'm thinkin', if no one loses, what's the incentive to improve? I was on an airplane earlier this month (no BIG surprise there...I've already flown about 35,000 miles this year, and it's only the middle of April!) and I met someone traveling on business. He was set to go from NY to London to Barcelona...and back home to New York, all within about a week. The more we got to talking, the more interested we became in each other's businesses. He's in the fashion industry, I'm in the leadership development field. At one point, the conversation turned to the following topic: "But...how do you get everything DONE?" I'm currently "in the middle" of three books right now (the first three on this list), each one giving me specific ideas on how to focus, how to prepare, and how to act on the MITs (the Most Important Things). And, I took some notes during our "flight-conversation." Here are the ideas we came up with for enhancing workflow habits and creating the time, space and focus to work on those important tasks and projects. Here is our list of three...what would you add? Turn off the computer monitor, and set an alarm to work on one "file" (or project, or area, or...) for 15 minutes. Read, write or plan until the alarm tells you 15 minutes have passed. At the end of the day, write 3 specific projects you want to work on the next day. Put that paper with your car keys or wallet - look at it before you leave for work, and decide: Yes or No! Ask someone to watch you work for an hour. Don't talk them, and don't do anything differently - just respond to e-mails, file papers, write notes...do what you normally do. At the end, ask them to tell you what they saw. How did you stay focused, and where did you lose focus? ...and, it happened last month...TWICE! You see, both of the leaders of these companies contacted me several times throughout the planning process. We coordinated conference calls; and, we created specific learning objectives for the one-day seminar events.